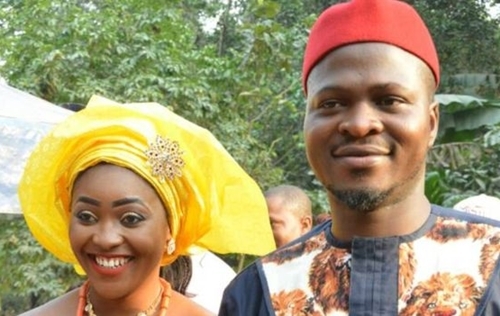 A newlywed Nigerian couple who got married after seven days of acquaintance on social media has shared their experience with BBC Africa, and it was absolutely "Love at first sight." Everyone who uses Facebook will have come across some pretty strange posts in their time. Random friend requests, being added to groups you did not ask to join, and tags that allow "friends" to clog up your timeline with posts or photos you don't necessarily want. interested in being his wife to reply. "Am of age to and I am ready to say I do and am wasting no time. "Send in your applications - the most qualified will be married on January 6, 2018. Application closes 12 midnight, 31/12/2017," he posted. He then followed up with subsequent posts. "Am serious about this oh and don't say you did not see it on time. Good luck." He received a couple of responses, but one from a certain Sophy Ijeoma was the one which caught his attention. "Am interested, just DM me...lols," her post read. At first, she thought it was a joke and she simply replied to keep the thread flowing. A direct message from him to her inbox, followed by a Facebook call, would change her life's trajectory. Two days after their first conversation, he travelled some 500km (300 miles) from his home in the northern city of Abuja, to Enugu in the east where she lived. She had been waiting for him outside a retail store and in true fairy-tale style, "it was love at first sight", she recalled. "He is the most handsome man I've ever met and I liked him instantly." After two hours of "awkward" conversation, he asked her to go to meet his uncle, who incidentally is also resident in Enugu. Asked what was going through her mind at the time, she said she thought it was all a bit of a joke, but she was excited about it and thought Chidimma was quite an interesting character. "We got to the uncle's house and he said: 'Uncle, meet the woman I want to marry.'" Like Chidimma, his family don't seem to hang about when it comes to getting things done, because the uncle gave his approval. Getting family backing for your choice of spouse is an essential part of Igbo culture. Whereas picking your future wife from dozens of respondents to a Facebook marriage advert and marrying her in six days is decidedly not. At this point in their day-old relationship, it was beginning to dawn on Sophy that this fellow was not playing, but how do you commit to marrying someone you only just met? She would not comment on whether they had even shared as much as a kiss at that point, but maintained she was captivated by how focused and determined her new fiancé was. "When I saw him for the first time, I definitely found him attractive, but what I didn't know was how serious he was about marrying me. "It was after we met the uncle and his wife, that I realised that this could actually happen and I wanted it." It was now her turn to worry about how she was going to get the approval of her family to marry a guy she had just met on Facebook. But they had momentum going for them. Having met and fallen in love at first sight, or first message, if you like, and getting Chidimma's uncle's approval, the couple decided to complete the cycle by visiting Sophy's family the same day. Sophy recounted how she relayed the information to her mother. Her dad had passed away, and her mum said she did not have the final word in terms of giving approval for her to be married, so it was up to Sophy's elder brother to give his blessings. It would appear the odds were firmly in their favour as Sophy's brother gave his blessings too. So after a few questions from her brother, it was official - Chidimma and Sophy were engaged to be married in six days. Last year Chidimma was engaged to another woman and the wedding was scheduled for December, but the relationship fell apart in March leaving him dejected. As December approached, the disappointment of not being able to fulfil his dream of getting married made him put up the post, he said. "I had the desire to get married, I had a date in mind, but no bride, so I decided to place an advert as a joke, but I was open and up for it." Asked whether she knew about his earlier engagement and her thoughts on how this seemingly rushed marriage might be seen as a rebound, Sophy dismissed any suggestions that her relationship was not well thought through. "I don't care about that - when you see what you want, you go for it." They had been friends on Facebook for more than a year, but had never met or spoken to each other until the advert. "Am interested, just DM me...lols" was all it took for the union to be formed. Sophy admitted her friends were sceptical about the whole thing, while some are still in disbelief, but as she said: "When you see the one, you will know he is the one". Happily ever after? They got married on 6 January in a traditional Igbo ceremony, and posted photos of their wedding day on Facebook of course - to the amusement of the social media community. Chidimma put up a post saying people may have thought he had been joking but he clearly wasn't. As can be expected, there were mixed reactions, but mainly a lot of support for the couple. They hope to have a church wedding in April and perhaps a honeymoon somewhere nice, he said.